No refunds will be given within 9 days of the first day of the class/workshop and no refunds will be given after the class/workshop begins. No refund for personal emergency. No refund for no show, regardless of the circumstances. No refund for drop out or dismissal of the workshop/camp after it has begun for any reason. ART INSTRUCTION = Tuesday, Wednesday, Thursday, 9am-1pm. This will be an option for parents who need the younger campers to stay the whole day. The second half of the day will be much less educationally intensive than the first. Some of the topics from the morning may be covered in the afternoons activities but there won’t be any progress made on the main projects so that students who leave at 1pm will not fall behind. The extension option is available below. What better time to look at bugs than the summer? If you've wondered if a spider was an insect or how many legs does a centipede really have this may be your art class. We will be exploring Art that moves! Each student will create a self-portrait out of clay! Each day will be a different adventure in Art! We will be exploring Art that moves! Learning about both physical and visual balance in your work that will move with nothing but a little breeze. Kids will get to be a different artist for each day! They will learn about the life of the artist and how this affected the way their artwork looks. Students will use a coil-building method to create a mug, then use black slip to decorate the pot using geometric patterns in the style of the Ancestral Puebloans. During this class each artist will be having fun while learning to draw, paint, print, and mask their selfie and a few other faces as well. Do you love Trains? In this exploratory summer camp we will create artwork using Trains as our inspiration. Students will create and invent a monster or creature friend. They will look at personality traits as well as ways of expression.! The age old art form of book making will thrill your child in this camp as they experience the excitement of binding their own sketchbooks or stories. 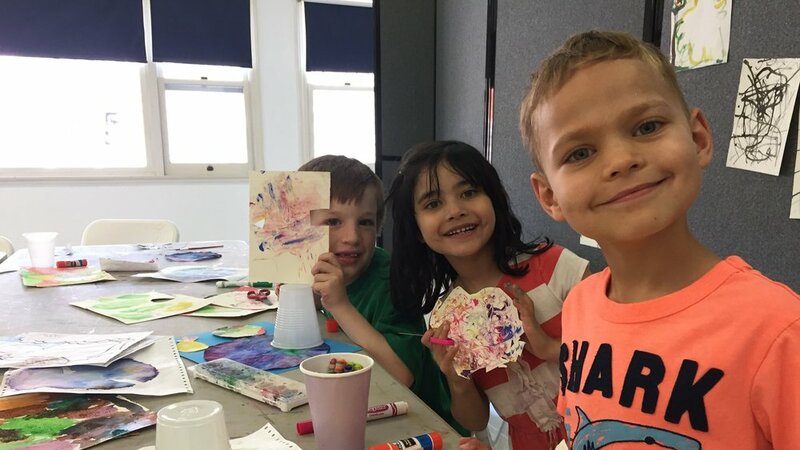 Our little artists will be inspired by an assortment of art from different cultures such as aboriginal art, native american art, Japanese art, and much more. Have fun learning new techniques and painting skills, and explore your creativity while designing your own original masterpieces.